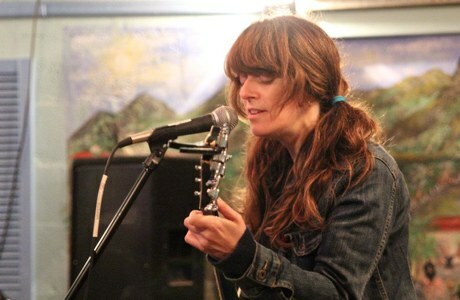 When she's not teaching yoga, Julie Doiron has been devoting her time to recording a new album with her former Eric's Trip bandmate Rick White. Come January, she'll also be undertaking a busy live schedule thanks to a month-long residency at Toronto's Saving Gigi (859 Bloor Street West). She'll be playing at the cafe every Thursday night next month, which means 4 shows in total, beginning on January 5 and ending on January 26. To make the shows even more special, each performance will include a special guest. Evenings will begin with a solo set by Julie, then a solo set from the guest, and finally a duo set from Julie and the guest together. We can't yet give away who the guests are, but given the many artists Julie has worked with over the years, you might be able to make some educated guesses. Each week's special guest will be announced on the Tuesday before the show. The capacity of the venue is just 25, so you're going to have to be quick on the uptake if you want to purchase tickets. They cost $15 and will be sold at Saving Gigi. Tickets for the January 5 show go on sale today (December 28).